The Medical College of Wisconsin (MCW) is a private medical school and graduate school of sciences headquartered in Milwaukee, Wisconsin. Formerly affiliated with Marquette University, it has operated as an independent institution since 1967. It has two additional campuses, one in Green Bay and one in Wausau. MCW is accredited by the Higher Learning Commission of the North Central Association of Colleges and Schools (HLC) and by the Liaison Committee on Medical Education (LCME). It is one of only two medical schools in Wisconsin, along with the University of Wisconsin School of Medicine and Public Health in Madison, and the only private one. The Medical College began to be realized with the founding of the Wisconsin College of Physicians and Surgeons in 1893 and of Milwaukee Medical College in 1894. In 1906, Marquette College (now Marquette University), merged with the nearby Milwaukee Medical College. On May 14, 1907, Milwaukee Medical College became the Medical Department of the newly chartered Marquette University. In 1913, in response to the standards introduced by the Flexner Report, Marquette University purchased the Wisconsin College of Physicians and Surgeons, thereby creating a separate institution, the Marquette University School of Medicine. During World War II, the school developed close ties with the local Veterans Health Administration hospital in Milwaukee. In the 1950s, local philanthropist Kurtis Froedtert, bequeathed much of his estate to the establishment of a teaching hospital, which became today's Froedtert Memorial Lutheran Hospital. Opened 39 years ago in 1980, Froedtert Hospital is adjacent to MCW and is one of the three major affiliated health care centers where MCW students, residents and physicians practice. On September 30, 1967, Marquette University terminated its relationship with the medical school because of financial difficulties, and the school continued as a private school. It changed its name to the Medical College of Wisconsin in 1970. MCW has more than 16,000 alumni, all of whom are represented by the Medical College of Wisconsin-Marquette Medical Alumni Association. There are more than 1,200 students enrolled in education programs at the Medical College of Wisconsin. This consists of about 817 medical students and 400 graduate students. An additional 670 physicians in residency and 180 physicians in fellowship training work with the College's affiliated hospitals throughout the state. About 160 scientists conduct postdoctoral research with MCW. MCW grants M.D., Ph.D, M.S., M.P.H., M.A., and combination degrees. Through the Medical Scientist Training Program (MSTP), students may enter a combined M.D./Ph.D. degree program. Joint degree programs with other institutions are offered in: bioinformatics (MS) and healthcare technologies management (MS) with Marquette University, and medical informatics (MS) with the Milwaukee School of Engineering. In addition, Graduate Certificate programs are offered in Clinical Bioethics, Public Health, Research Ethics, and a joint Bioethics Certificate with the American Medical Association. Residency training is offered in nearly 30 medical specialties and subspecialties. The average MCAT scores and undergraduate GPA for the entering class of 2011 were 31.9 and 3.70, respectively. About 60% of the incoming class was male, and the mean age was 23 years old. The highest number of incoming students completed their undergraduate degrees at the University of Wisconsin–Madison, Brigham Young University, University of Illinois at Urbana–Champaign, Marquette University, UCLA, and the University of Minnesota. U.S. News & World Report ranked MCW's medical programs as 54th for research and 62nd for primary care. Shanghai Jiao Tong World University Rankings placed MCW in the top 101–150 medical schools in the world, and MCW as an institution was in the top 401–500 universities worldwide. The biological sciences graduate program was 106th, while the statistics program ranked 53rd, according to U.S. News. As a research center, the Medical College of Wisconsin received more than $154 million in external support for research, teaching, training and related purposes in fiscal year (FY) 2013–2014. MCW received about $79.5 million in NIH funding and ranked 46th among 137 medical schools in the country for NIH research funding. Its faculty conducted more than 2,500 research studies, including clinical trials, in the same fiscal year. Overall, it is the largest research center in the Milwaukee metropolitan area and the second-largest in Wisconsin. ^ a b c d e f g h "Facts about MCW" (PDF). mcw.edu. Medical College of Wisconsin. Retrieved 30 March 2015. ^ a b c d "History of MCW". mcw.edu. Medical College of Wisconsin. Retrieved March 3, 2013. ^ An Anchor For The Future: A History of the Medical College of Wisconsin. 1991, The Medical College of Wisconsin., pp. 1,7. ^ An Anchor For The Future: A History of the Medical College of Wisconsin., p.8. ^ "Lutheran medical school is proposed". Milwaukee Journal. January 10, 1962. p. 1, part 2. ^ Spaulding, James (September 4, 1968). "Froedtert Hospital to be part of center". Milwaukee Journal. p. 1, part 1. ^ Patrinos, Dan (May 13, 1980). "Froedtert Hospital opening set". Milwaukee Sentinel. p. 5. 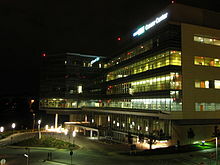 ^ "UWM keeps medical school goal". Milwaukee Sentinel. October 2, 1967. p. 5, part 1. ^ "Knowles urges aid for medical school". Milwaukee Journal. February 13, 1968. p. 1, part 1. ^ "Marquette medical school insists on private control". Milwaukee Sentinel. June 26, 1968. p. 8. part 1. ^ Shively, Neil H. (November 28, 1968). "MU school fund bid gets powerful ally". Milwaukee Sentinel. p. 1, part 1. ^ "Medical school here in danger of closing". Milwaukee Journal. July 14, 1969. p. 1, part 1. ^ Spaulding, James (September 22, 1970). "School of Medicine drops 'Marquette'". Milwaukee Journal. p. 1, part 1. ^ a b "Programs & Degrees". mcw.edu. Medical College of Wisconsin. Retrieved 3 March 2013. ^ "Residency Programs". mcw.edu. Medical College of Wisconsin. Retrieved 3 March 2013. ^ a b "Class Profile 2011" (PDF). Medical College of Wisconsin. Retrieved 3 March 2013. ^ a b "Medical College of Wisconsin". Education | Colleges. U.S. News & World Report. Retrieved 30 March 2015. ^ "Medical College of WIsconsin". Academic Ranking of World Universities. Shanghai Jiao Tong. Retrieved 3 March 2013.